A well functional elbow is demanding for the use of the upper limp. Injuries in this region may interfere with the patients everyday activities. Elbow pain is often caused by overuse. It is very common among sportspeople and manual workers. The commonest elbow injury is lateral epicondylitis. It is usually known as Tennis Elbow. It is a painful condition involving the tendons that attach to the bone on the outside (lateral) part of the elbow. Sports such as tennis are commonly associated with this but, only the 5% of the people are actually into tennis. What Causes Common Elbow Injuries? Elbow pain, a number of disorders could be the culprit. 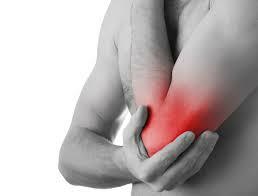 Overuse and sports injuries cause many elbow conditions. For example, golfers, baseball pitchers, tennis players, and boxers often have elbow disorders. Elbow disorders may involve arm muscles, elbow ligaments, tendons, and bones in the arm. The treatments for elbow disorders depend on the underlying cause. With accurate assessment and early treatment, most elbow injuries respond extremely quickly to physiotherapy allowing you to quickly resume pain-free and normal activities of daily living. Please ask you physiotherapist for their professional treatment advice.